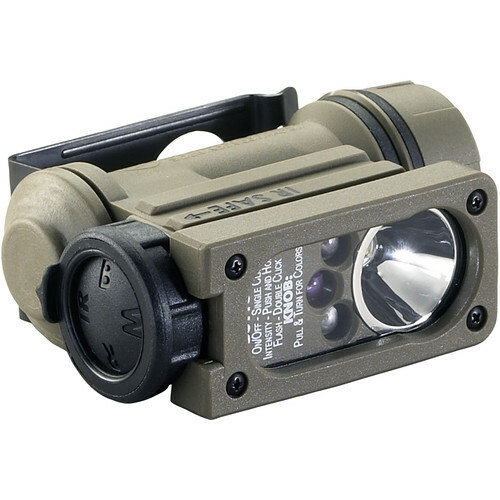 Clip the Streamlight Sidewinder Compact II Military Model Hands-Free Light to your belt, clothing, helmet, etc., and direct white, red, blue, and infrared light wherever you need it. This sturdy O-ring-sealed nylon housing tilts 185° for positional flexibility and can run on CR123A or AA batteries (lithium or alkaline) for versatility. Select the light color you need by means of a compound, pull-up rotary dial and push-button rubber dome that's easy to handle, even when wearing gloves. All the light colors can be set to shine at 100%, 45%, 25%, or 10% of their peak output, as well as in peak-output strobe mode. A tactile polarity indicator helps you make sure you put batteries in the right way, even in the dark, so you won't damage your light. The housing is IPX7 rated, submersible to 3.3, and impact resistant to 9.8'. The gasket-sealed lens is made of break-resistant polycarbonate with an anti-scratch coating. This item comes in clamshell packaging.